Following the completion of the Keys to the Kingdom arc there are just two more multi-issue arcs left, thirteen issues to be precise, in this dark emotional pulse-pounding comic series from creators Joe Hill and Gabriel Rodriguez. Along the way, the children of the Locke family continue to face the trials and tribulations of growing up in what’s basically become a parent-less household. Especially in Keys to the Kingdom, their mother is barely glimpsed and when she is, it’s hinted that she’s still struggling with the alcohol addiction she’s had since the death of her husband, Rendell. For Kinsey and Tyler Locke both their main struggles outside of the conflict with the dark lady involve the mortal perils of teenage relationships. Both experience break-ups and conflict with their significant others. In Tyler’s case, it’s a betrayal that urges him to become a little closer to the dark side of himself he’s spent a while trying to deny following the move to Lovecraft. It also finally encourages him to put the trappings of the normal teenage boy’s life aside some in order to realize that he’s the man of the house now—and this household needs serious protecting. In doing so, he makes a shocking revelation that carries sudden and deadly implications. In Kinsey’s case, she’s dealing with the first real relationship of her life—only it happens to be with the two-faced Zack Wells aka Dodge, the supernatural evil force that’s trying to kill all of them and bring about chaos on Lovecraft. It was a brilliant move issues back in the series to have Kinsey remove her own ability to feel sadness and fear, because otherwise I’d have screamed even more in frustration as love-sick Kinsey hung all over the very creature who’s tried to kill her and her siblings in his current quest for the Omega Key. But once you fully look at the situation how it’s been portrayed it’s easy to think about what most every teenage girl acts like when she has these feelings for the first time. You act stupid and you trust too much in addition to letting yourself be very vulnerable. All things that no one can afford to be around Dodge, or he’ll make sure you regret it if you live to. To her credit, when the time to act comes about Kinsey absolutely puts her money where her bloodied ice skate is. Bode Locke takes the dangers of his life in stride the way any young boy would. To him, all of these strange occurrences and magic keys are just the sorts of adventures he spends time playing imaginary games about anyway—actually getting to live them out is just fun. But in this arc he learns a few valuable lessons about sacrifice and the whole being more effective than the one. In fact, much of this arc seems devoted to bringing the Locke kids closer together bit by bit again so that by the end they can start to prepare for the final battles at Keyhouse. Except the attempt to remove this evil presence from their lives was too little too late as Dodge is now in the position to be closer than ever to his goal. Much like the namesake of a recently deceased supporting character, Ellie Whedon, Joe Hill has no issue with killing off characters suddenly and unexpectedly. No matter the level of tragedy in what or who they leave behind. In the case of Coach Whedon’s bloody sadistic demise at the hands of Zack, the emotional collateral damage would be a truly heart-wrenching scene where Ellie’s son Rufus holds the person who was everything in his life as tears stream down his face. When reading over those pages it became achingly clear that now is when things are going to get even deadlier—perhaps for all of the characters. At this point, I’m really not so sure that the remaining core members will survive the final battle, but let me make it clear that I love it. Unpredictable yet well-plotted coherent twists and turns are what make great fiction. The events throughout the six issues culminate in a way which satisfies the arc, but also keeps the reader breathless for more. Of course it isn’t just the story that makes Locke and Key streets ahead of anything else currently on the racks. Rodriguez’s art pops and simmers depending on what the scene requires. He’s as good at portraying quiet emotion-fueled single character panels as he is sudden brutal violence that spreads across a double page spread. 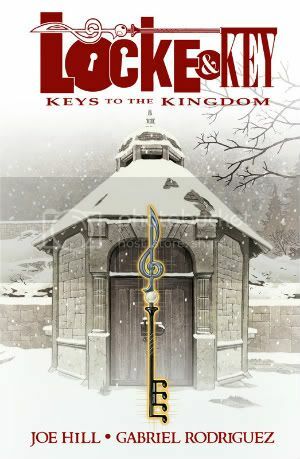 Not to mention each and every cover in Keys to the Kingdom tantalizes with nothing more than a clue of an important inanimate object and a new key to be found in the issue. Rodriguez is so comfortable with the distinct lines and shades of his series that there are two issues in Keys to the Kingdom (1 and 4) that take time to pay homage to classic comic styles. The styles of richly-inked pulpy war comics and Bill Watterson's Calvin and Hobbes are both used as different ways to convey the appropriate story. It's never contrived or gimmicky and in issue four in particular, it's very effective when Rufus meets up with the ghost of Sam Lesser portraying himself as a casualty of war--make no mistake that's exactly what he is in this series. Going from playing soldier with his new friend Bode to being lead down into the depths of the real war being waged all around him, Rufus displays a solid bravery in trusting a ghost--it does certainly mimic Bode's friendship with the lady from the well but... we all know how that turned out. The dark and eerie quality in these panels lend a calm before the storm vibe to the issue. That is until the blazing red eyes of Dodge are sketched into the darkness of the page. Those hateful merciless eyes declare to the reader before the ghost of Sam can to young Rufus the bold truth: the war is on and playtime is over kid. That commitment to metaphor and foreshadowing are what makes up the storytelling bread and butter of this series, and it never disappoints. With the stunning events of the last issue as Dodge allows the sacrifice of his form in order to swap souls with that of Bode Locke--Hill and Rodriguez have set up a hell of a game-changer entering into the final rounds of this game of keys and what forms of darkness that certainly lay behind those doors that should never be opened. It's just a true shame that the television adaptation of Locke and Key has faced such development hell. First it wasn't picked up by Fox during pilot season--really the world needs a Bones spin-off. Really. Then after being shopped around it is still without a home. Most accounts from those lucky enough to have seen it express that the pilot, directed by the inimitable Mark Romanek who no doubt put a wonderful visual stamp on it, is an achievement. Next week, the show will have a panel and screening at San Diego Comic Con and I can only hope that the fans will respond in a way that would bring a tightly-written series that isn't afraid to incorporate various genres into its story to the airwaves. It's accessible even if there are elements that on paper may make those averse to the horror/fantasy genres balk, at first. After all, this is purely a story about the struggle of one broken family that won't stop fighting the darkness that threatens to envelope them all. An idea that's easy to relate to and get behind even if if your house isn't stuffed with magical doors and cupboards.